Covering football in Hungary, Austria, Germany, Switzerland and other parts of the continent,Mittel is very much a “greatest hits” from the award-winning Game of the People website. Players like Puskas, Netzer, Sindelar, Panenka and Bican are featured, along with teams like RB Leipzig, Ferencvaros, Dukla Prague, Hungary, Young Boys Bern, Honved and Torino. 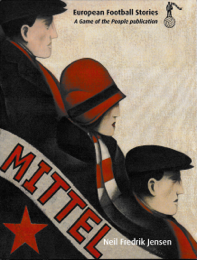 Mittel is the first Game of the People publication. Price £ 11 including P&P. Published by Isherwood Editorial.